Charleston, South Carolina, is a sweet place to live. The weather’s great year-round, and there are plenty of ways to explore the outdoors and water no matter the season. The only thing really missing from the palette of fun outdoor things to do in Charleston, SC, would be mountains for some better hiking. But no place is perfect. Despite that (obvious) lack, there’s another major plus of our corner of the world where the South slides into the Atlantic Ocean. Did you know that the coastal plain of the United States from southern Maine to the Gulf of Mexico has been declared a Biodiversity Hotspot? The region was recently added to a short list of 36 regions. These areas represent the most biologically rich and most threatened terrestrial areas in the world. These 2,151 species are found nowhere else in the world. The American Coastal Plain includes such major cities as New York, Washington, and Houston as well as Charleston. But the beauty of Charleston, South Carolina, is that the rampant development of Northern cities was more controlled here. As such, the savannah prairies, swamps, and marshes that provide habitat for the many endemic species is more readily available. There’s no better way to experience the natural beauty of the Lowcountry than by getting outside. 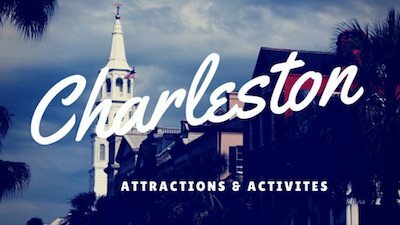 Feel free to skip around this list of the most fun outdoor things to do in Charleston and use the activity you choose. Or read the whole way through and let me know everything you love and hate about our list. You do you. This list was compiled with help from Kyndra Luce, native Charlestonian and outdoor enthusiast. She runs Famous-Adventures, a local outfitter that plans fun activities for groups around Charleston. If I had the money, the first splurge buy (after a bike) would be a kayak. Kayaking in Charleston, SC, is a relaxing experience. There’s no better feeling than a calming kayak trip along the Stono River between Johns Island and West Ashley. 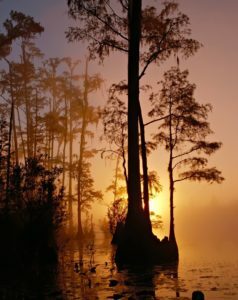 And watching a sunset over the Lowcountry from a kayak is an experience that will make you feel one with the world. Unfortunately, I can’t pull the money together for a kayak. But there are some fantastic kayak outfitters in the Charleston area. 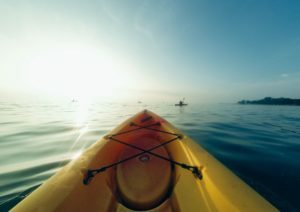 While kayaking from Shem Creek is popular, I recommend kayaking from Folly Beach. The marshes and waters around Folly Beach are less built-up, and the relaxed beach vibe of Folly Beach adds to the fun. Our favorite kayaking outfitter is Charleston Outdoor Adventures. Yes, Charleston is not California with its stereotypical massive waves, but learning to surf here can hone your skills for bigger adventures elsewhere. 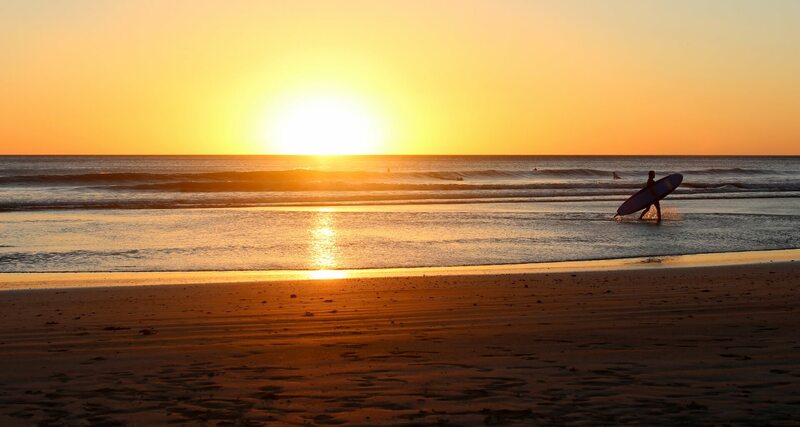 Head to Folly Beach for the best waves and the most surf culture. Etiquette tip: stay out of the way of seasoned surfers until you’ve had a few lessons. The Washout. Though small, it’s some of the best surfing in the Southeast. Not comfortable with your surfing skills? Neither am I. 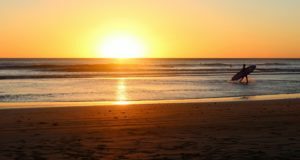 You can get some classes with Charleston Surf Lessons on Folly Beach. 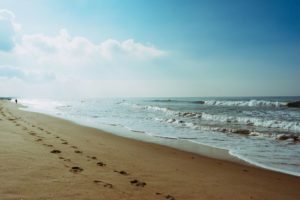 Check the waves before you head to the beach: http://www.surfchex.com/follybeach-web-cam.php. Or download the Swell Info App to keep up with surf predictions. Not for the faint of heart (or those afraid of heights), but spending some time on top of a ropes course can be an exhilarating experience. You may have noticed the Wild Blue Ropes Adventure Park from the road on James Island, but it’s worth a visit! It features over 70 obstacles and the opportunity to swing from tree-to-tree, all over 35 feet above the ground. It’s definitely worth writing home about after the fact. Once you’ve swung, hung, and worked your way through a high ropes course, what’s next? Charleston’s only zip line, of course. Witness the pine savannah of the Francis Marion National Forest from 65 feet up as you zip along several different lines. Just like the ropes course, though, zip lining with Charleston Zip Line Adventures is not for the faint of heart. Then again, neither is surfing before a hurricane. Before you get too excited about hiking in Charleston, SC, keep in mind options are all relatively flat and often quite muddy. 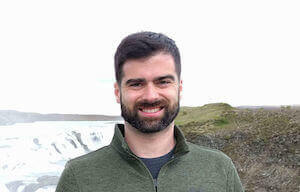 Want what Coloradans or Northeasterners consider hiking? Then drive to Greenville, Asheville, or Boone in the Appalachian Mountains. Not feeling a 4-hour drive this weekend? Head out to one of our fantastic local parks. Over the border from Charleston in Ravenel, Caw Caw County Park is a collection of former rice plantations that have reverted back to nature. An extended walk is a great opportunity to see wildlife close to Charleston. There’s even just driving around for those who love their air conditioning. This is obviously not a park, but hear me out! The Ravenel Bridge is one of the highest elevated points nearby–you can see the bridge for miles around the Lowcountry. And a walk from the base to the highest point is invigorating. It also offers a great view of historic downtown Charleston below. And if you really need a hike with changes in elevation but don’t want to drive, beggars can’t be choosers. Millions of tourists every year can’t all be wrong, right? A walk around historic downtown Charleston neighborhoods is almost a daily evening ritual for me. The historic homes are gorgeous, and the air in the spring is thick with the scent of flowers. Just watch out for horse poop from the Charleston carriage tour rides and tourists that don’t know how to drive in the narrow streets. Located on the opposite end of Folly Beach from the Washout, Folly Beach County Park offers beautiful views over the water to the south. The summer months can be pretty busy with tourists who think they can only use the beach on this end, though. James Island County Park is another easy walking area, with paved roads and pathways. There are plenty of other things to keep your whole family occupied, including pedalboat rentals and a splash pad. This place is one of the best things to do in Charleston, SC, with kids. This county park in Mount Pleasant is more nature-oriented than James Island County Park. As such, there are more natural areas, including an entire island with nothing but walking trails. Palmetto Islands County Park has more than a few paved walking paths, that said. 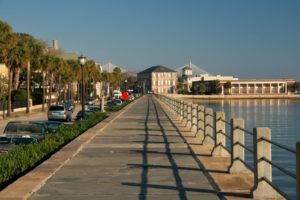 Running along the sea wall and the ginormous mansions that line the Battery and White Point Gardens is a great reminder of what a fantastic place Charleston is. It’s also a perfect way to both get your exercise and be thankful you don’t have to foot the bill for one of those mansions. You can run along the Ashley River on Murray Boulevard, pass White Point Gardens, then head up East Bay Street past Rainbow Row to Waterfront Park. This is the largest park in downtown Charleston, and often the least visited. It’s likely because it’s so far up the peninsula (near the Citadel). That said, the road that circles Hampton Park is exactly a mile, so running there is an easy way to keep track of your distance. It’s also quite pleasant to be surrounded by such big trees and greenery. 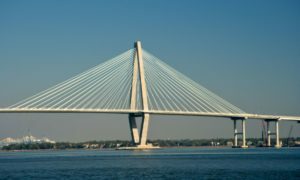 Head over the Ravenel Bridge to Old Town Mount Pleasant, and run from the Pitt Street Pharmacy area towards Sullivan’s Island. The Pitt Street Bridge is one of those special places not everyone knows about. The beautiful views of Charleston, especially at sunset, makes it one of the most romantic things to do in the Charleston area for couples. A run with your significant other might be a little too much sweat for romance. Maybe save this run for the second date. You’ll notice Kiawah Island and Seabrook Island aren’t on the short list. They weird me out. I’m going to be completely honest, Aerial Fitness isn’t my thing. But I’ve been told by a very trusted source that this is a lot of fun, and a great workout. Also, 10 seems like a better number for a list than 9. Aerial Fit Charleston teaches circus arts to the curious or those looking for a fun way to stay in shape. They offer classes ranging from aerial yoga to static trapeze to aerial hoop to aerial silks. If you’re interested, go visit the Circus Building in West Ashley. But you won’t likely run into me there, I’m not going to lie. But it’s a pretty good start. This list definitely contains many of the best things to do in Charleston, SC, and nearby. Though the jury’s still out on aerial fitness classes. So get out there and explore the open air of the Charleston Lowcountry! And be sure to appreciate how much of the area (relatively) has been left untouched.